This is a stunning 80 carat black diamond interchangeable necklace. You can wear it as a 30” inches long necklace or break it down to a 23” inch long necklace, and one 7” inch long bracelet. It has a total of 5 pieces of 14 karat yellow gold champagne diamond spacing beads and stringed in 14 karat yellow gold lobster clasps. 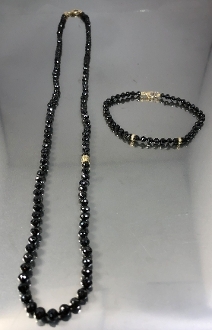 The black diamond faceted beads range from 3-4 mm in diameter and individually knotted between each bead.